Reseller Hosting providers offer a web hosting service where the owner of a server or hard drive space can allow other people to host their websites using their hard drive space and bandwidth for a fee. If you’re looking for online services similar to Reseller Hosting, consider our Shared Web Hosting or Cheap Web Hosting categories. 100% whitelabel reseller hosting allows you to be independent and set your own standard, all while having the experience of GlowHost's team available anytime if you need us. 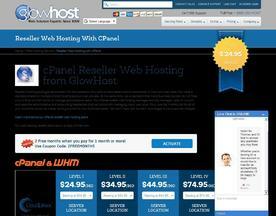 Unlimited accounts, unlimited domains, and the control of WHM at your fingertips.